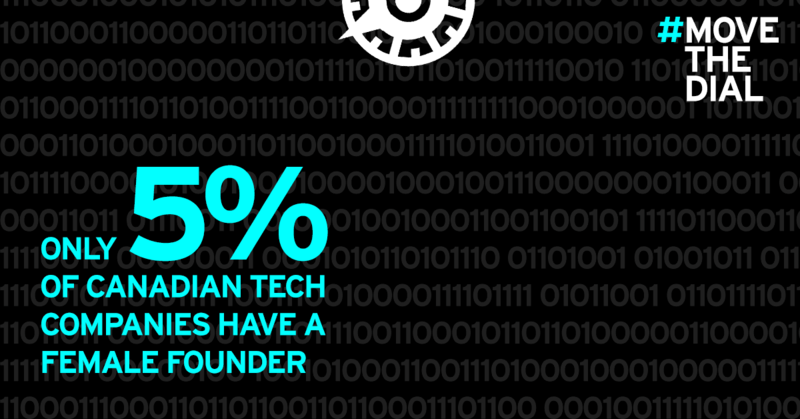 Only 5% of Canadian tech companies have a female founder or CEO. #movethedial’s benchmark report creates opportunity to drive sector change. Toronto, Ontario — November 1, 2017 — #movethedial, a movement focused on increasing the participation and advancement of women in technology in Canada, released its benchmark report Where’s the Dial Now? amid growing discussion about the gender gap in Canada’s technology sector. Approximately 30% of Canadian venture capital firms have a female partner. The report and its findings are supported by a broad cross section of Canada’s tech and venture capital leaders. In addition to the lead authors’ work, several other firms contributed to this report by providing data and support including AceTech Ontario, BDC, Canadian Venture Capital Association, and Osler, Hoskin & Harcourt. #movethedial is a movement dedicated to increasing the participation and advancement of women in technology. Founded on the premise that advancing the full talent pool will make Canada’s tech industry the strongest and most inclusive in the world, #movethedial believes the opportunity for gender parity exists at a global level. Proudly headquartered in Toronto, Canada, #movethedial is working to drive support and commitment to the #movethedial movement at home and internationally. Learn more at: www.movethedial.ca. At Ceridian, we create innovative technology that organizations around the world use to attract, develop, manage and pay their people. Our award-winning Dayforce solution helps our customers manage compliance, make better decisions, develop great teams behaviour and drive engagement with their employees. Ceridian has solutions for organizations of all sizes. Ceridian. Makes Work Life Better™. For more information call 1-877-237-4342 or visit www.ceridian.ca.